When it comes to exercise, it’s hard to beat bicycle riding. Biking combines cardiovascular fitness with building strength and stamina – and it’s fun. You can get a good workout while enjoying a ride in the park. And people of all ages and fitness levels can do it. It’s one of the easiest ways to exercise. You can ride a bicycle almost anywhere, at any time of the year. All you need is a bike and half an hour several times a week. It tones you all over. Biking improves general muscle function with little risk of strain or injury. Regular cycling strengthens leg muscles and is great for the mobility of hip and knee joints. Gripping the handlebars also helps tone your upper body. It’s great for your heart. You can easily boost your heart rate for a good cardiovascular workout. Pump it up by including hills in your ride. 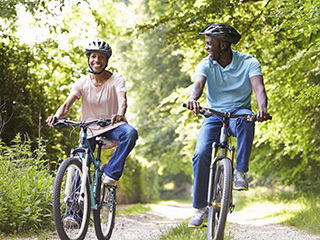 Studies have shown that 30 minutes of moderate riding three times a week can help lower your blood pressure and LDL (bad blood cholesterol), reducing your risk of heart disease. It boosts energy. Research has shown that bike riding improves energy and decreases fatigue. How? Cycling triggers your brain to release the neurotransmitter dopamine, which is linked to energy. It’s kind to your joints. Riding a bike puts a lot less stress on your knees, ankles, and spine than running or other high-impact exercises. Most people can easily ride moderate distances without much strain or pain. It promotes weight loss. Riding can burn hundreds of calories per hour, depending on your size and how fast you go. Since it helps build muscle, cycling will also boost your metabolic rate long after you’ve finished your ride. This chart shows how many calories you can burn on a bike. It helps reduce stress. Like any regular exercise, riding can reduce stress and depression and improve well-being and self-esteem. It’s also a good way to be enjoy nature and refresh your mind and soul. Most people can do bike riding. However, if you’ve been inactive, it’s a good idea to consult a doctor first. Your doctor can advise you regarding your limits and capacities and what you should avoid doing. Be safe. Biking is fun, but it’s important to get the right equipment for the activity. Always wear a helmet and consider knee pads and elbow pads in case of falls. And if you plan to ride on the streets, make sure you obey all traffic laws, use proper hand signals, and wear bright, visible clothing so cars can easily see you. Start off easy. For beginners, begin by riding 30 minutes three times a week. Gradually increase the number and length of your rides as you gain strength and experience. Speed up slowly. Gradual increases in speed are an important aspect of fitness cycling. Cycling can be strenuous, so the key to successful fitness riding is to be patient and not hurry in increasing your limits. 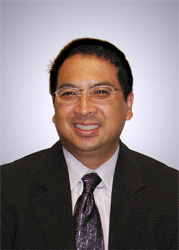 Jose Zarzuela is an MPCP partner and practices in our Pasadena office. He is certified by the American Board of Internal Medicine.